QQQX is a closed-end fund sponsored by Nuveen, seeking attractive total return with reduced volatility versus the NASDAQ 100. The fund is currently distributing 6.83% and is trading at a premium of 1.15% to its NAV. We take a deep dive into the fund to identify if and whether it fits in your portfolio today. In the summer of 2017, I covered a set of Nuveen closed-end funds that really hit my interest check-boxes. 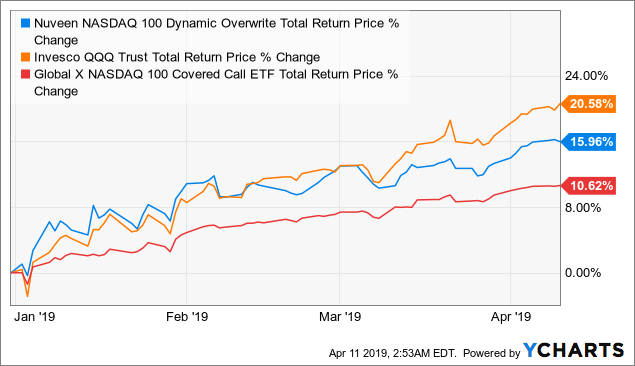 They were low cost, unlevered, and generated meaningful income from covered call options, all while providing investors market exposure with reduced risk. 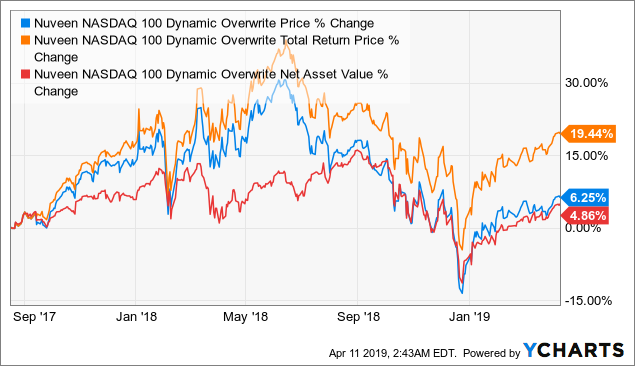 One of the funds is the Nuveen NASDAQ 100 Dynamic Overwrite Fund (QQQX), which sought to generate a total return with reduced volatility to the NASDAQ 100. Now that some time has passed, let's circle back to see how the fund performed. What should be most interesting is to see how the fund performed during periods of both bull and bear periods in the market we recently went through. Investment Objectives: The fund seeks attractive total return with reduced volatility versus the NASDAQ 100. 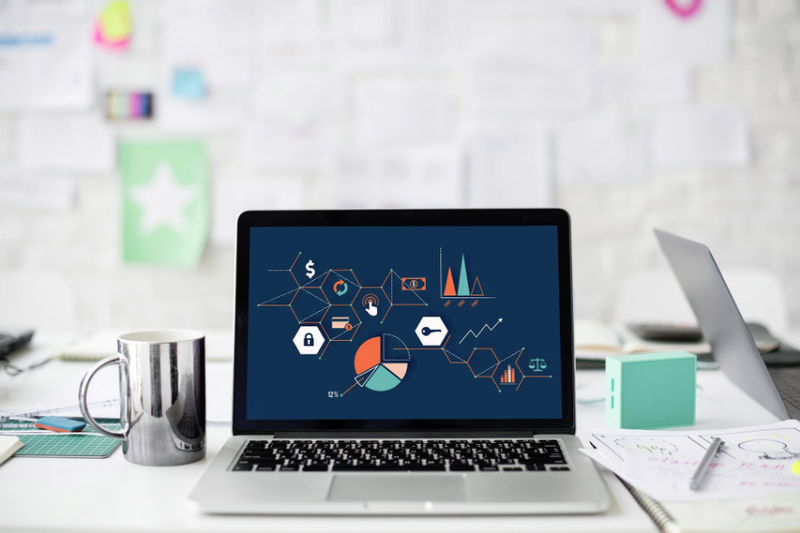 Sources: CEF Connect, Nuveen, and YCharts. 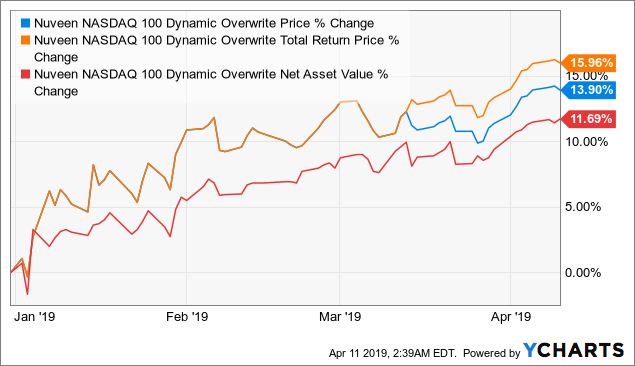 One immediate change to note is that Nuveen Chief Strategist and manager on the fund, Keith Hembre had left the firm in late 2018. He was replaced on the fund by Jody Hrazanek. David Friar remains with the fund. One of the unique features of the QQQX in the closed-end fund space is that it is in a sense an index fund with a covered call strategy. The vast majority of closed-end funds are actively managed instead. The names are those that you would find in the NASDAQ 100 index. The top 10 holdings make up 66.9% of the fund and, as such, this is VERY concentrated. 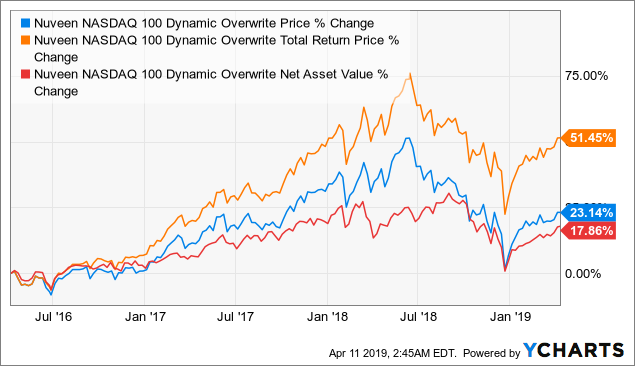 One of the caveats to investing in the fund is that you should be okay with the vast majority of your holdings being Microsoft (MSFT), Apple (AAPL), Amazon (AMZN), Alphabet/Google (GOOG) (NASDAQ:GOOGL), Facebook (FB), Cisco (CSCO), Intel (INTC), Comcast (CMCSA), Amgen (AMGN), and PayPal (PYPL). If you are looking for diversification, you are not going to get it as the majority of the fund is technology focused. If you are looking for technology diversification, then you found the right place. As you can see, there is enough hardware, software, and services diversification. Looking at the fund, breakdown shows us the portfolio with its 166 holdings. Keep in mind, that the number of holdings includes the individual options written on the fund holdings. The holdings themselves are largely large caps as that is the focus of the NASDAQ 100, the 100 largest technology-focused holdings. What is quite nice to see provided by the sponsor for a covered call fund is fairly detailed statistics on the options. As we can see, the fund currently has options written on about 61% of the portfolio. Furthermore, we can see that on average, the fund seemed to write slightly in the money options. While this does generate higher options premiums and income; in a market rally, the fund would be called on those options and would likely not be participating in the upside. This is the biggest risk of covered call strategies. Lastly, we can find that as of the end of February, the options had an average of 11.84 days until expiration. This would imply that the fund most likely writes monthly options, 30 days out. This is also generally the best place to be in the option's time decay curve. Looking at the risk data, we find that the fund has a 5-year beta of 1.073. This implies that the fund is essentially as volatile as the broader market. In this case, the S&P 500. The QQQ ETF, for instance, has a beta of 1.15. The maximum draw-down which the fund experienced remains the same at 57.28%, a reminder of what the fund experienced during the 2008 financial crisis. 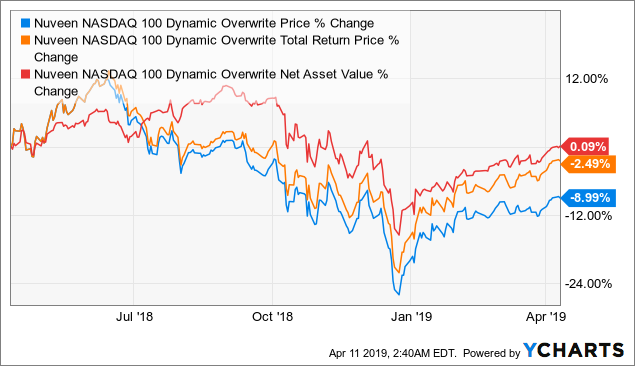 The Nuveen NASDAQ 100 Dynamic Overwrite Fund does not use leverage. As such, it carries far lower fees and is more appropriate for most investors. The fund currently distributes a $.39 per share quarterly distribution. The distribution has increased since our initial article but has dropped from its previous one. One of the reasons for the increase in the distribution is higher interest rates. Options premiums are based in part on interest rates and as such, the increase in short-term interest rates has been a net benefit. The current market distribution yield is 6.83% as of 4/11/2019. 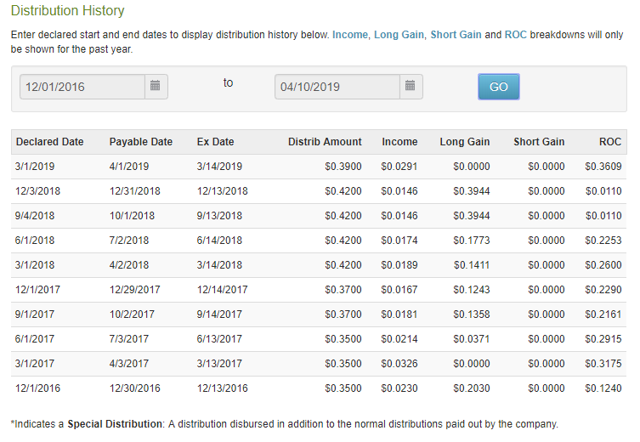 Looking at the distribution history, we find that as per CEF Connect, a large percentage of the distributions are generally gains or return of capital. Over the last few closed-end fund articles, I have been screaming about the quality of the distribution and we have seen many closed-end funds distribute significant return of capital. QQQX also distributes return of capital... so how is it different? The difference here is that it is not quite as destructive. The fund generates income through writing options. When those options premiums expire, that money is then capital of the fund. As such, when the fund pays it out as a distribution, it is classified as "return of capital." To see whether it is destructive or not, we will have to look at the financial statements and the underlying net asset values. 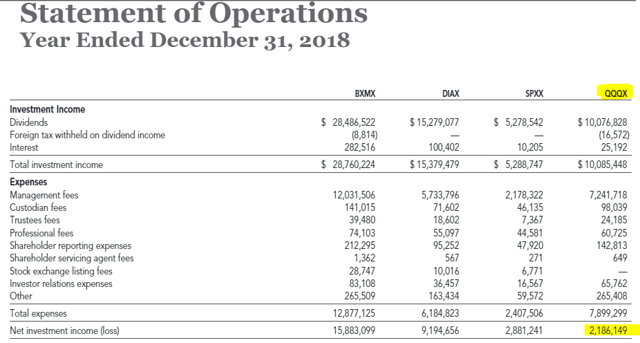 For the 12 months ending Dec. 31, 2018, the fund earned $10 million in income. This was predominantly dividend income. During this time, the fund had a total of $7.899 million in expenses, predominantly made up of the management fee. This left the fund with a $2.186 million net investment income. The fund predominantly generates its income through options. Unfortunately, 2018 was not a great year for the funds, both due to the poor performance of the equity markets and being called on the options. At the end of the day, the fund's value decreased $36 million. As such, we can fairly safely assume that the 2018 distributions were destructive to the NAV, unlike in previous years. The fund is currently distributing a market price distribution yield of 6.83% and is trading at a PREMIUM of 1.15% to its NAV or net asset value. The chart above is very very interesting and I believe will easily answer a major question that a number of other authors have had... "Why has the fund underperformed?" If you have not picked it out yet, let me help. As we can find, 12 months ago, the fund was trading at a major premium. Today that premium is essentially gone. 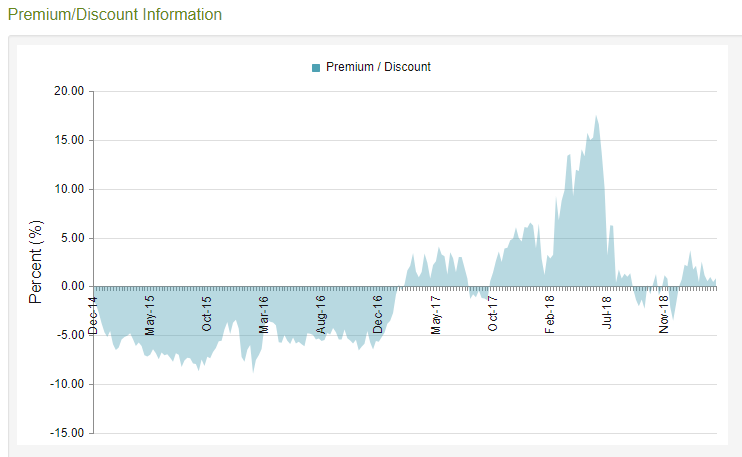 Below is a better chart showing the long-term history of the premium/discount for the fund. For whatever reason, investors were all too happy to pay a 15% premium above the net asset value. Today, that premium is gone and so is 15% of the value of the investment, without taking account the underlying performance. Performance wise, year to date, the fund has participated in the market rally. Investors achieved a total return of 15.96%. The fund's price per share increased 13.9% while the net asset value increased an 11.69%. This implies that the discount to NAV shrank or the premium increased. Over the last 12 months, we can find that the investors would be down 2.49% on a total loss basis. 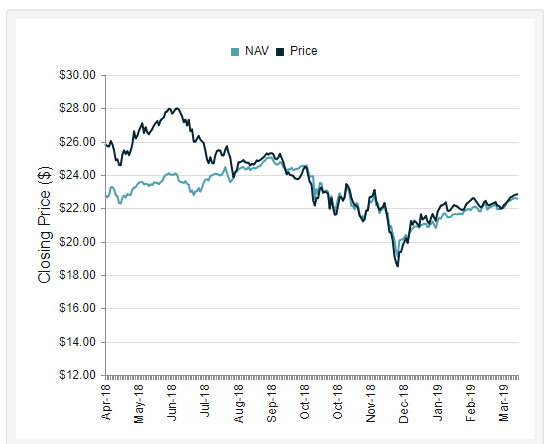 The price per share declined 8.99%, yet the underlying NAV, even excluding the distributions, increased 0.09%! Since our last article on August 17, 2017, the fund has actually done fairly well. The fund achieved investors a 19.44% total return. The price per share increased 6.25% while the net asset value increased 4.86%. This tells us that the discount to NAV shrank and has turned into a premium since our last article. The last 3 years have been quite good and were even better early last summer! The fund achieved a 51.45% total return. The fund's price per share increased 23.14% while the NAV increased 17.86%. This further reminds us that the discount to NAV shrank during this bull market. 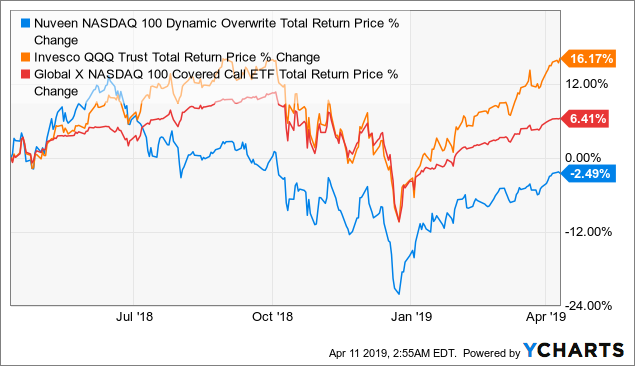 We take a look at the fund against the PowerShares QQQ (QQQ) and the only covered call fund that I was able to find for the Nasdaq, the Horizons/Global X Nasdaq 100 Covered Call ETF (QYLD). Year to date, while the closed-end fund has lagged the uncovered NASDAQ 100 index, it has meaningfully outperformed the Global X Covered Call ETF. Over the last year, there is nothing that should have been unexpected. 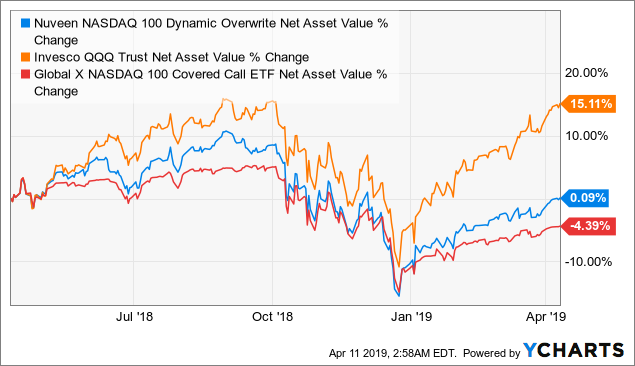 Investors were not only outperformed by the underlying NASDAQ 100 and ETF returns but QQQX were treated to a net loss! 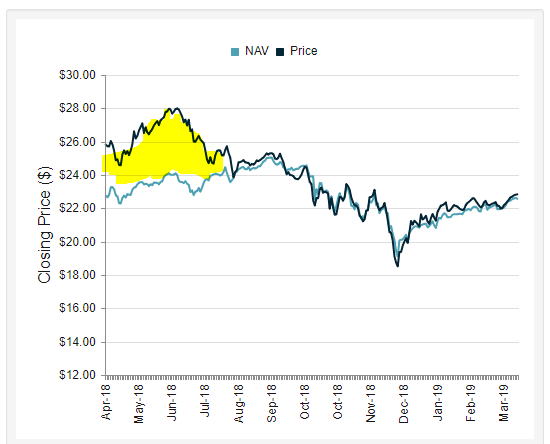 Yet, if we look at the net asset value performance, we do find that the Nuveen fund did outperform the ETF. The reason why there is a difference? Investors said "good-bye" to the 15% premiums they paid a year ago! Over the last three years, the picture returns to "normal." In essence, QQQX kept up or surpassed the uncovered QQQ and had handily beat the fully covered Global X ETF. At the time of writing our initial article 2 years ago, while I did not own QQQX myself, I was okay with investors buying it, especially if they were looking for tech exposure with an income stream. Over the last 12 months, however, I believe this fund earned a bad reputation in large part due to no fault of its own. As we can clearly see, the largest reason for the recent underperformance is investors waking up and not being willing to pay the 15% premium to NAV. When we look back, it is rather silly to think that the fund even traded at such premiums when the underlying strategy was so easily replicated. This is why I believe the 15% premiums were not justified. 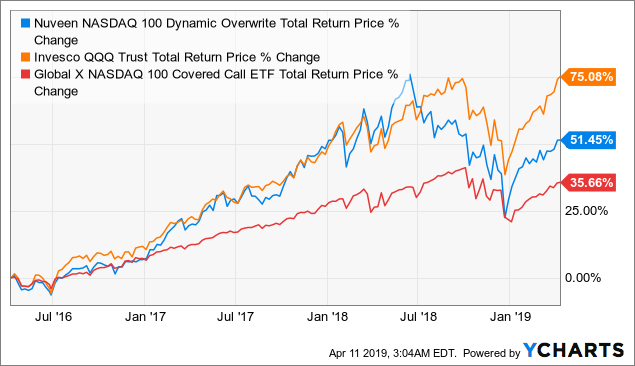 Experienced investors would have generally avoided the fund as they could replicate the strategy themselves by buying a Nasdaq ETF such as QQQ and then writing covered call options in the amount and at the price they wanted. For those same reasons, they are not the target investors for this fund. Income investors, however, would be interested in the fund for two reasons. First, the fund provides a good strategy in a single ticker solution with very reasonable fees. Second, the fund provides a nice income stream and may at times be purchased at a discount to its net asset value. This is, of course, secondary to the fact that there are no other direct competitors that employ an active covered call strategy on the NASDAQ 100. For more information on the fund, please visit the fund's website at Nuveen - QQQX. I hope this was helpful and of interest. As always, thank you for being a reader and a special thanks to Income Idea subscribers. We will continue to monitor this fund in the future.